For almost a decade, First Lutheran Church in Boston has celebrated J.S. Bach’s birthday (332 years ago as I write) with a daylong set of recitals featuring organ, harpsichord, voices, and this year flute. The observance last Saturday, coinciding with the 500th anniversary of the Reformation, was organized and curated by church music minister Jonathan Wessler with the support of the American Guild of Organists’ Boston chapter and local Bach keyboardist Peter Sykes, who lent harpsichords. The morning began in suitable seriousness as St Paul’s (Cambridge Mass.) organist John Robinson called us to attention with the chorale prelude “Jesus Christus, unser Heiland (sub Communione)” S,665. The Richards, Fowkes instrument in pleno or near-pleno registration wonderfully occupied the dry brick-and-wood space, loud and with uncommonly satisfying bass. Robinson chunked passages to an extent, but that penchant became problematic only in the “Trio super: Allein Gott in der Höh sei Her” S.664, whose phrases were not much shaped despite his exact ensemble (which is the test of Trio playing). With S.686, the Keyboard Workout’s imposing choral setting “Aus tiefer Not schrei’ ich zu dir”, and the Prelude and Fugue in G major S.541, Robinson resumed stride, although in the latter there again was momentary impeding of forward motion. The chorale prelude “Herr Jesu Christ, dich zu uns wend” S.709 introduced the organ’s tremulant, which to my taste displeased at nearly a sanctuary-clearing level, like someone playing with a sinewave generator’s output; perhaps it could be adjusted. Probably period-authentic. The dramatic Fantasy and Fugue in G minor S.542 lacked grandeur under Robinson, and he took the Fugue too fast as well. In the Fantasy, Bach carves out big hodge-podge moments of suspended chromatic chords, climbing in power, which here went mostly for naught, and in the nifty Fugue, which the composer sometimes used for showing off, the voices were not long-lined and clearly overlaid (contrast 11:14 here, from the unequaled Anton Heiller). Cornering even entailed a moment or two of what at least one organ teacher 50 years ago labeled “emergency rubato”, which for some reason no longer seems something absolutely to be avoided, so often do we hear forced micro-slowdowns. Brink Bush is organist at Ste. Anne’s (Salem Mass. ), and a scholar of German Romantic organ music and aficionado of Virgil Fox. I was psyched that his portion began with the Fantasy and Fugue in C minor S.537, as it was Fox’s grim read of that grim work, especially its soul-troubling opening page, that caused adolescent me many decades ago to fall for Bach’s ominous organ music. (That was before Fox leaned 100% meth-Wagnerian.) But Bush too took things on the fast side, and the work lost its fearful grip. The chorale prelude “Liebster Jesu, wir sind hier” S.731 featured lovely loud registrations; “Nun freut euch, lieben Christen g’mein” S.755 rejoiced hastily; that tremolo reappeared in “Ich ruf zu dir, Herr Jesu Christ” S.639; and the coming of “Nun komm, der Heiden Heiland” S.659 went unsmoothly. However, Brink managed the energetic S.578 Fugue in G minor and the pedal-theatrical Prelude & Fugue in A minor S.543 with distinction. The former sped by perhaps too détaché, admittedly a choice, but the latter featured the most potent playing thus far, even as each section appeared to have its own rubato and its own pulse and the fugue approached being hurried. The Luther League I once belonged to did not always aim for fun activities, but the 10am Children’s Event break brought smiles to First Lutheran families. Parish Admin John Lindemann’s lively narration of Ernest Thayer’s famous 1888 “Casey at the Bat” (probably not that famous anymore) got covered at times by the loud organ. But Robin Dinda’s lively musical arrangement, Fenway fanfares and all, was dispatched with dash, and occasional yummy sour cadences, by Wessler, who can augment his day job anytime he wants by subbing on the Sox’ Yamaha Electone AR100. I bet its tremolo is something. Respected Bach keyboardist (and Wessler predecessor, now at St Peter’s Lutheran in NYC) Bálint Karosi and eminent Bach scholar Christoph Wolff led us through more than an hour of the composer’s harmonic, particularly chromatic exposure, education, growth, and achievements. As an older teenager in a culturally polyglot Germany, where other countries’ musics crossed paths, rubbed shoulders, and often intermarried, Bach was already self-schooled in the daring of Sweelinck, Buxtehude, Pachelbel (family friend), Werckmeister, and others. We learned of his changing mastery of, and departures from, form, his daring tastes for sharps, the growth in delineation from WTC I to II. Karosi, to demonstrate while interleaving with Wolff Q&A, played the revolutionary (chromatic arpeggios and runs) Prelude in B minor S.923, the unusual-for-its-group Toccata in G minor S.916, the Chromatic Fantasy and Fugue in D minor S.903, and the WTC II Prelude and Fugue in G major S.884. He concluded with the French Suite (none of the nationally named suite sets deserves such a label) No. 2 in C minor S.813, which was intended to be a dance mixtape. Karosi performed with lovely colors and no little drive, notably that superlative D-minor Fugue. He too however sprinkles his playing with unneeded micro-pauses, for expressivity and making small points. I don’t get that either, even though just about everyone does it. Those who know the solid playing of Harvard’s Christian Lane would assume that his Boston Organ Studio students—Lane evidently has become successor to Yuko Hayashi, ruler of local organ pedagogy until NEC ditched its program—would have their rhythmic strengths evenly together. Three of them, all Harvard or MIT graduates working in STEM / biomedical / healthcare fields in addition to their organ studies, demonstrated serious prowess and accomplishment. Old West organist (yes, she does that as well) Jennifer Hsiao danced and bewailed powerfully through the great Toccata, Adagio and Fugue in C major S.564 and “O Mensch, bewein dein Sünde groß” S.622 and “Von Gott will ich nicht lassen S.658”, her Fugue becoming another high point of the day. Laura Gullett ran into patches of stodge in the happy Prelude, Largo (S.529ii) and Fugue in C major S.545, and that middle movement seemed almost unending, but she still was able to drive to grandeur by the Fugue’s end. Khristian Erich Bauer-Rowe essayed the Prelude and Fugue in D major S.532. In it Bach has big fun with scales, in the Fugue idiotically so, and the performer labored in some passages, segmenting them. Nonetheless, he too was able to reach to grandeur, and his ending thrilled. I cannot help pointing out the intense climactic treats that most know. 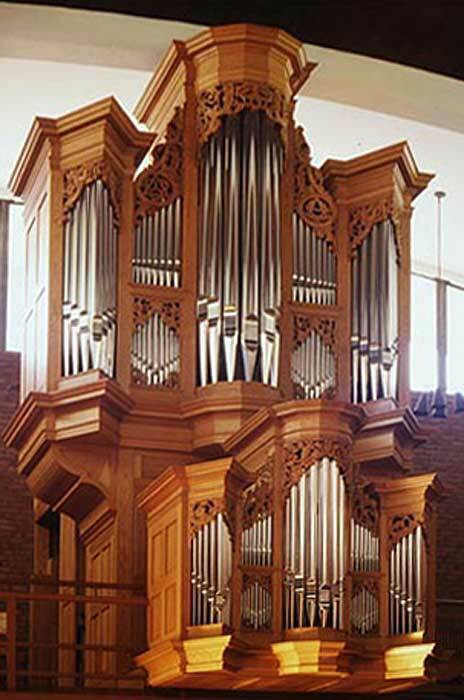 In Bach organ music, typically but not always in passages toward the end, occur those loud, complex, disparate moments which burst from seeming near-chaos into clarity—when the massive mobile parts, sectional transparent overlays expectedly (for some maybe unexpectedly) align. I’ve heard it analogized as interplanetary geometry, or stained glass panels; on Saturday I thought of the sudden fit being like the laser sight on target in a futuristic weapon. Lame images aside, nothing else in classical music is like it. It’s the whole reason for sitting patiently through Bach organ recitals, regularly suspending disbelief. I mention this awesome moment of congested motion leading to grateful shock just because it arrived for me during the last pages of Bauer-Rowe’s S.532 labor. Impressive work, then, a tribute to the three students and their teacher, who all know that, as in sports, doing your best sometimes means you just put your head down and go. Hungarian flutist Gergely Ittzés, now at BU, has a big clean tone. He offered up a lengthy program of two Bach Partitas and a Newman Partita after Bach. In S.1013, written for the instrument, the sound was large and, in its closing Bourrée anglaise, the downward steps and rests positively jazzy. The Newman work, from 2003, sounded altogether idiomatic: conservative, harmless, repetitive, pleasing. Ittzés did not hurry. In the last Partita, assembled from Bach’s S.1001-6 for violin, the flutist hit his stride, again and again deploying deftly controlled breathing and tonguing, in service to intricate quasi-polyphony, especially in Bourrées II and I Double. Musicality of line and smoothness of phrase may not be Ittzés’s strongest characteristics, but to a nonexpert, Bach on flute inherently seems to entail difficulty in long phrasing . Wielding a richly operatic voice, baritone Ethan Sagin soloed in three secular cantatas, Bach’s “Amore traditore” S.203, Handel’s “Dalla guerra amorosa,” and Telemann’s Kanarienvogel-Kantate. Maybe because a Lenten mood had entered my soul, I was not inclined to be taken in by love laments, but the improvised fluidity of the first, the poignancy of the second, and the extended sorrow of the third overcame any resistance. Sagin’s backup group comprised violinists Karen Burciaga and Amy Sims, violist Karina Schmitz, with Wessler at the harpsichord. Theatrically declamatory appropriateness for this repertory apart, Sagin becomes (like most) a touch wooly and indistinct in his lower range, but not badly so, not off-key. Better yet, his Italian was good and his German was better, with extra inflection, and charmingly dramatic and crisp in Telemann’s lengthy (eight movements), commissioned, gruesomely melodramatic (meaning at once serious and over the top) “funeral music for an artistically trained canary”—which concludes with a yell at the murderous alleycat, “I wish you stoned to death”. All righty, then. While the band accompanied Sagin with full sympathies and expertise, more remarkable to me was Wessler’s touch at the keyboard, which flowed smoothly in luscious, silvery streams, without break, without added expressivity, evenly forward-moving, perfectly paced. All rushing organists with tendencies to arrhythmia (for whatever reason) should imagine accompaniment, clearly. With organist Christopher Holman (Christ the King Lutheran Church, Houston) it felt as though we were taking a modest but genuine step up in professionalism. His Toccata in F major S.540 constructed the proper big hinges for its big swings, underpinned or punctuated by steady pedalwork. The Fugue likewise unrolled with dour momentum. All of the other works, “O Lamm Gottes, unschuldig” S.656, “Trio super Allein Gott in der Höh’ sei Ehr’” S.676, “Wenn wir in höchsten Nöten sein” S.641, “Durch Adams Fall ist ganz verderbt” S.637, and “Gelobet seist du, Jesu Christ” S.604 shone with gorgeous loudness, and at that chilling point two-thirds of the way through S.656 where Bach grandly strides into 9/4, Holman performed an appropriately commanding pleno walk. All of this effort may have tuckered the organist out, as the Fantasia in G Major S.572, with those huge chromatic suspensions trying to hang in air, lost drive, and by the end was more arpeggiated mess than not, even when what sounds like the QE2 arrives. The Vespers Prelude featured NEC student violinist Kate Arndt accompanied by Karosi in the Violin Sonata No. 1 in B minor S.1014. Arndt on this day, in the first and third slow movements, was low in sweet intonation and musical probing, but her two Allegros became lively and settled. What stood out, as with Wessler before him, was Karosi’s smoothly propulsive accompaniment, steady of tempo and fluid of rhythm: this was marvelously gauged harpsichord playing. The Vespers music did not slump in performance quality, and would set a standard for most regular working church services. Wessler led the choir and played keyboards. Alto Carolyn Balkovetz movingly resisted sin in “Widerstehe doch der Sünde” S.54, supported by violinists Sims and Burciaga, violist Schmitz joined by Sarah Darling, and cellist Jesse Christeson. Other works augmenting the Lenten service included Andreas Hammerschmidt’s “Psalm motet: Schaffe in mir, Gott, ein reines Herz”, Schütz’s Magnificat “Meine Seele erhebt den Herren”, and two sobering hymns of Luther. With noble sturdiness Wessler offered us “Aus tiefer Not schrei ich zu dir” S.687, yet the day ended with the Prelude and Fugue in E minor S.533, his interpretation informed by more expressive pauses and inflections than that short easy piece really needs or warrants. A. wonderful day for everybody. Great misic in a fine setting. To hear Cristoph Wolff on Bach is an experience that we all can enjoy. Mr. Moran’s review is excellent. This special day should not be missed. A fine German midday meal was an excellent addition to this program. If you wish to have a fine day at the First Lutherin Church, come next year. This Bach Birthday Bash event won’t disappoint you. Far better to hear great music than the self indulgent chaotic noise of the cello concerto by Pintscher recently commiisioned and played by the BSO and reviewed by this publication.